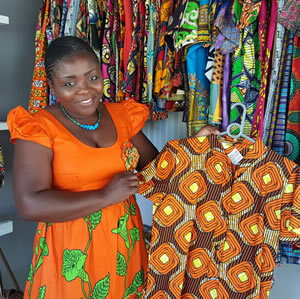 Nicky Mayoyo designs gorgeous clothing for children, ladies and men from colourful African fabrics, uses those same fabrics for bags, accessories, bandanas and stuffed animals, and also makes her own line of jewellery from semi-precious stones. I started by doing hair braiding at Spier 12 years ago and then learned to make jewellery. I went to CCDI for training with jewellery design and that inspired me to start making it as a business. My younger sister also makes jewellery, she has a shop at the Watershed and she taught me some more. What inspired your clothing range? My clothing was inspired by the African fabrics. I've been at Spier - off and on - for a number of years and added the clothing line four years ago, first a children's range and then the men's and ladies' clothing. Somebody taught me my sewing skills and now I design and have two ladies who help me with the sewing, We sew the clothing, bags and animals together. Some of the clothes have beading on them to make them special and unique and that I do myself. The jewellery I make all myself, the semi-precious stones are also from Africa, like the malachite from Congo, the tigers eye from South Africa. Usually while I'm at Spier I sit at my table and make the jewellery live while I look after my stand. Some are from the Congo, some from Angola and I also use Shwe Shwe from South Africa - they reflect my own history, I'm from both countries - my mother is from the Congo, my dad from Angola and my home is now South Africa. I'm working with the fabrics of the three countries where I come from. What does Spier mean to you? Spier means everything - it's the platform that made me who I am today. When I started there I was nothing, now I have my own business. It gave me the opportunity to be myself, become my own entrepreneur, creating different things, having customers. It has allowed me to expand - I have customers overseas who buy something here and then get in touch to order more. Having that connection is amazing. I also sell at two other markets, but Spier is my main outlet. Visit Spier Craft market daily 10am-5.30 pm . Nicky is usually there in person on Mondays and Wednesdays if you'd like to chat about her work while she makes her jewellery.